Your building’s roof should be durable enough to withstand Florida’s inclement weather, strong winds, and other elements that can threaten to wreak havoc on your business. If your current roof is not living up to these expectations, Veterans National Property Services is the commercial roofing company you can trust for a professional roof replacement service. Our Service-Disabled Veteran-Owned Small Business (SDVOSB) is committed to providing your Tampa Bay business with a premium commercial roof replacement that you’ll never have to worry about again. 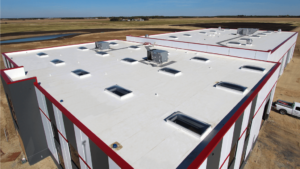 Custom prefabrication – Designed to fit your roof’s exact dimensions, this membrane will seamlessly protect your business without wasting or splicing material. 40, 50, and 60 mil membrane thickness – Duro-Last’s membranes are manufactured in three different thicknesses to help better meet the requirements for a variety of properties. The experts at VNPS are dedicated to providing you with a roof replacement service that exceeds your expectations. Our installers complete extensive training from leading manufacturers, so you can expect to receive a thorough installation that uses the best techniques available in the roofing industry. To learn more about our commercial roofing company and other roofing services we offer for your Tampa Bay business, contact VNPS today.